Over the last six months as Paramount Home Entertainment has begun releasing some of their greatest hits onto Blu-ray, it's been fascinating to revisit the works I watched repeatedly while growing up in Midwestern suburbia. While a majority have held up well despite some dated pop culture references-- one of the things that's always enjoyable about the discs is the current day interviews with the cast and crew as they talk about not just their involvement in a movie but also speculate as to why the film managed to catch on as a beloved contemporary classic. On the one hand, some are simply stunned and can't venture a likely assumption about the film's universal appeal such as Matthew Broderick who still seems incredibly humbled and awestruck by the life that Ferris Bueller's Day Off has taken on since its mid-80s release. 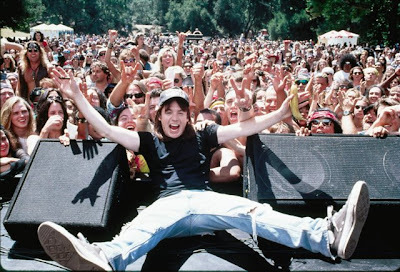 However, when it came time to explore the extras for director Penelope Spheeris' Wayne's World, Mike Myers managed to tap right into not just the central driving force of the two characters in the film but distills his thought into just under a sentence. While they cherish their public access television show they run out of Wayne's parents' basement (since as Myers' Wayne notes, he still lives with his parents “which is both bogus and sad”), the two guys aren't exactly blessed with the wheels provided by Bueller's friend Cameron Frye nor the expensive computer and technological equipment owned by Ferris. Despite living in an era of video games which they quickly learn as the snake-like TV executive Rob Lowe appears to exploit the show by working out an arrangement to commercialize it as essentially a cheesy version of a thirty minute advertisement for Bryan Doyle-Murray's Noah's Arcade-- our two heroes discover more proactive ways to party. 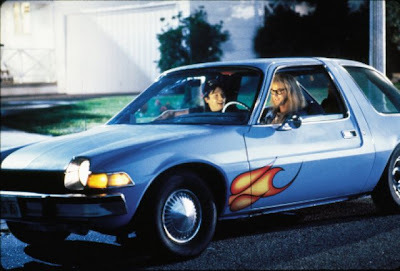 Whether it's rocking out to Queen's “Bohemian Rhapsody” (in a scene repeatedly filmed over the course of a night resulting in major neck and head pain) in the '70s era Pacer shared by the duo that's seemingly owned by Carvey's Garth Algar, filling up on jelly donuts, rescuing their “partied out” friend from being alone and drunk on the sidewalk, or poking gentle fun at authority figures-- the main goal of the two is to have as much fun as possible. 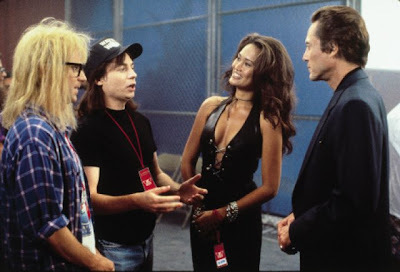 Proving that they “still know how to party” by frequenting the local heavy metal hangout-- it isn't too long into the film before Wayne sees the dynamic, beautiful, confident, and level-headed Cassandra (Tia Carrere) performing onstage with her band Crucial Taunt. As Cassandra and Wayne begin a tentative relationship despite Wayne's stalker “psycho hose beast” ex Stacey (Lara Flynn Boyle), Wayne and Garth find themselves facing another coming-of-age obstacle regarding selling out to the man when they blissfully sign a contract serving up the rights for their show to Rob Lowe's scummy yuppie who predictably decides that in addition to their show, Cassandra will be his next acquisition. Boredom is a word and a state of mind that doesn't exist in their vocabulary and it's on this level alone that it manages to reach us all since it comes from a very real and identifiable place since as Myers notes both on the Blu-ray and in the production notes, the character of Wayne Campbell was one he'd been playing with since the age of twelve to amuse people at parties. 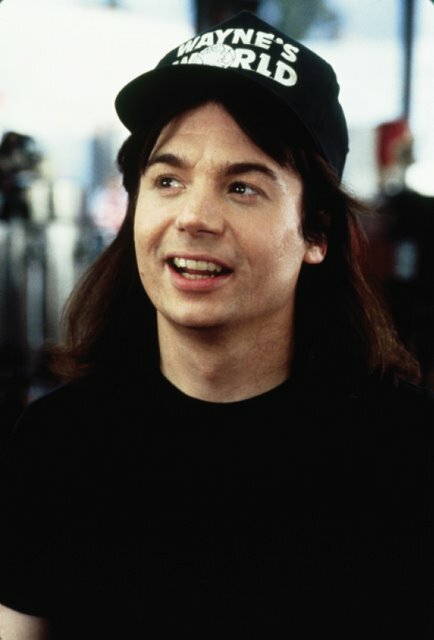 And of course, his infectious enthusiasm in bringing a sketch character he based on roughly five real people including himself was doubled when he was aligned with his ultimate side-man Dana Carvey's. For the film, Carvey earned the opportunity to finally help flesh out his simple one-dimensional worshiping sycophant from the skit in a feature length film (by of course keeping that same voice he "borrowed" from his his brother as inspiration). Moreover, suddenly, the energy from what could ordinarily have been much too broad in transfer of the late night few minute hit became both relatable and highly successful to fans around the globe-- head-bangers and non-metal enthusiasts alike. Simply put the characters laugh at the same things we all laugh at on a daily basis-- ridiculing feature filmmaking down to the traditional storytelling structure, talking directly to the camera perpetually, going into fantasy sequences, spoofing pop culture and inventing phrases we've come to take for granted (like “that's what she said” which is probably most famous today for Steve Carrell's over-usage of it on The Office). 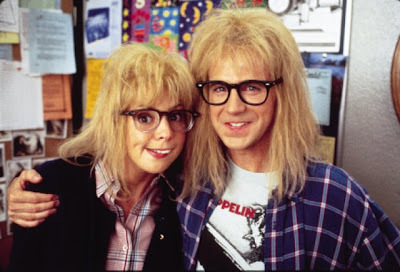 And as a writer, I can't help but assume that a great reason the incredibly fresh film still feels so vibrant today is because the screnwriters-- Myers and Bonnie and Terry Turner (who have since worked on other SNL projects like Tommy Boy) were-- much like the director and the stars, all involved in either their first studio project or their first film altogether. 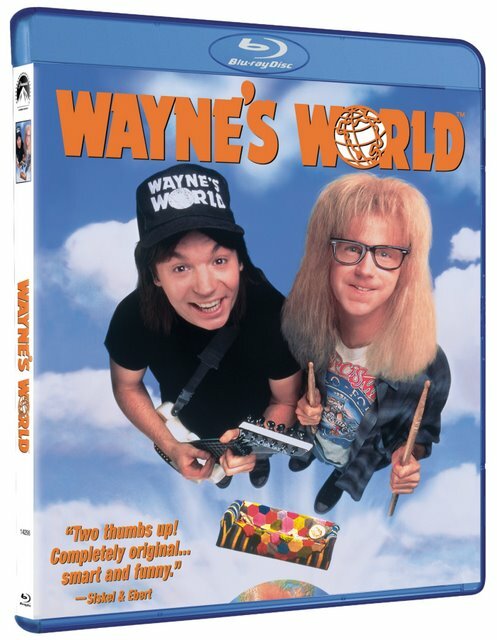 The highest grossing SNL movie based on a skit from the late night series-- incidentally Wayne's World was also SNL mastermind Lorne Michaels' first to be produced by Paramount in his exclusive SNL crossover deal (which resulted in an overwhelming number of misses that are luckily overshadowed by some amazing crossover hits for his talented cast). And I can't help but think that all of these ideas for "no-money" fun or not having a bullseye they specifically needed to hit helped unleash the freshest amount creativity from precisely the right group of people working together at precisely the right period of time. Listed on Siskel and Ebert's Top 10 list as one of the best films of that particular year and one of the highest grossing and biggest surprised of '92-- it's still a joy to watch today, both for sheer humor and the uplift you feel when watching characters who use genuine friendliness and curiosity to engage strangers (even when pulling their leg) rather than overtly going for a mean or rude approach for shock value. Additionally it's equally intriguing to go back and witness the talent involved firsthand once more when you realize just how underrated and overlooked actors like Carrere and Carvey were, essentially deserving much more work than they ultimately received. Likewise, for those who've been overly dismayed by Mike Myers' last few forays in the Hollywood system such as The Love Guru and the third Austin Powers sequel, it's nice to go back in time as if we were taking part in one of the Wayne's World magical ending options to witness his overwhelming potential to make us laugh (when he isn't solely fixated on toilet humor) and undeniable charm. Seeing the film for the first time since its VHS release, obviously for this reviewer, the transfer was a vast improvement. Yet in comparison to other Blu-rays, while there's a noticeable difference in depth perception, the overall picture (most of which was shot extremely quickly to fit into Carvey and Myers' summer time availability in between SNL seasons; and a good portion in poor light) battles a tendency towards some soft and muddied colors that blend into one another. However, and similar to some of the dated works being transferred to Paramount Blu-ray-- the studio's one consistent Achilles Heel is apparent from the start as the sound mix is uneven with faintly heard conversations and window rattling music as without any augmentation or speaker positioning whatsoever, I had to move the volume dial well past 60 on a stellar quality LCD TV. Despite this as far as I'm concerned once you balance it out, Wayne's World is well worth the audio tweaking as it still remains one of my absolute favorite comedies and one that's so surprisingly sophisticated and intelligent that it still makes me appreciate the multi-faceted, multi-layered jokes so many years later. And now when our society is definitely being hit with a need for “no-money fun,” one could do a lot worse than trying to look on the brighter side of inventing your own amusement a la Wayne and Garth instead of simply popping in a shooting video game and taking out your frustration with a computerized body count. As all involved acknowledge, once the '92 original far exceeded Paramount's wildest expectations at the box office, discussion of a sequel quickly followed and the final production rolled out just one year later. Yet despite the one year difference-- as far as the Blu-ray quality goes-- the jump from '92 to '93 is huge. I'm not certain if the difference was merely source based wherein possibly a much better version of the original theatrical print was taken for the transfer but whatever the case the sequel's clarity is sharper than the first one. And admittedly although this could also be due to the difference in budget and shooting style, likewise the sound balance is twice as good right from the start in crystal high definition clarity. Unfairly, it was maligned as a movie the very existence of which went against the very idea of fighting "the man" and "selling out" that the first one proudly used as a plot point. 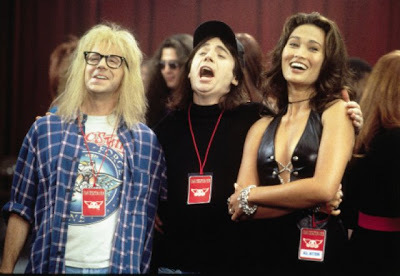 And while sure enough, the second helping of Wayne's World adds in an over-abundance of celebrities whether they appear in tiny cameos or new supporting roles and follows down familiar territory with more pop culture riffing-- but all that aside, it's still a whole lot of fun. 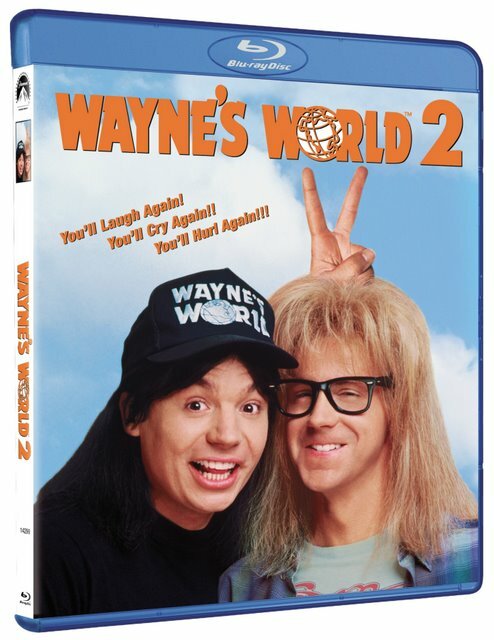 Whereas the first movie is solid all the way through, Wayne's World 2 can perhaps be best appreciated as as series of intensely funny, wildly freewheeling, sequences that are so unique they help distract from the rushed feel of the work. In fact, sequence-wise, I'd venture to bet that you'd be able to pull out at least six to eight sequences in the sequel that more than top the original... even if the film as a whole never quite reached that bar. One of those all-too-familiar individuals who still feels they were born a decade or two too late (as I have a strange faux '60s nostalgia myself)-- Myers admits he was possibly creatively foreshadowing the Austin Powers movies with this strangely psychedelic partly Doors-influenced and undoubtedly Woodstock inspired sequel. Having finally moved out of his parent's basement and rooming with Garth in an old doll factory turned over-sized place, Wayne begins wondering what he should do next with his life. Similar to where we'd last left him working on Wayne's World in their new headquarters and dating Cassandra-- while her career has begun to skyrocket and she spends more time with her smooth producer (Christopher Walken) than Wayne, he goes through an existential crisis. In a weird dream which finds him led out into the desert to chat with the ghost of Jim Morrison by "a weird naked Indian," Wayne decides that the purpose of his life is to put on a concert. Dubbing it "Waynestock," the guys adhere to Morrison's advice not to be stingy with the roster since "if you book them, they will come." 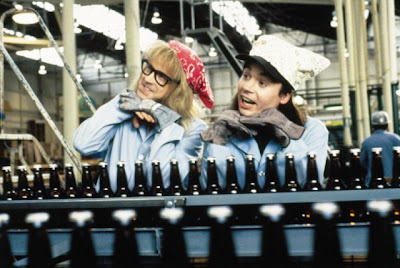 And in trying to seek out the best, Wayne and Garth travel to London to enlist help of a hilarious British wing-nut named Del Preston (the scene stealing Ralph Brown essentially channeling Ozzy Osbourne and Keith Richards among others) and lead their fellow slackers through a wicked course of roadie boot-camp. 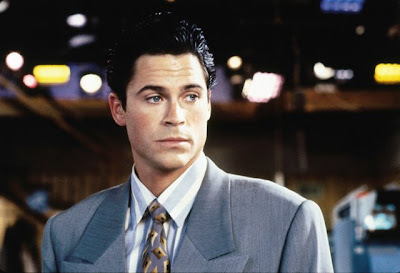 In a similar retread of the first movie which found Wayne worried about Rob Lowe's ulterior motives where his girlfriend is concerned, the same plot happens again in this film but it's to greater comedic effect. Long before Wayne partakes in a terrific send-up of dubbed kung fu fight scenes with Cassandra's dad played by James Hong (reason alone to buy the film and unsurprisingly Myers' favorite scene in the film), Christopher Walken ratchets up the intensity as a romantic rival. Deliciously wicked-- and far similar to those old creepy SAL "Continental" skits-- Walken truly is as Lorne Michaels calls him "a hidden treasure in comedy," nailing lines like "what are you doing here, Wayne?" before dirty dancing with his girl right in front of him, and chasing Wayne and Garth into a gay bar when he catches him spying that results in an impromptu "Y.M.C.A." Village People homage. However, the film feels at times like it's going through the motions in a few uninspired "skits" that find Wayne and Garth trapped in a car a la Jurassic Park. And aside from the fact that it continues on a good ten minutes too long in its brisk 94 minute running time during a gruelingly long ode to The Graduate (that saves itself with a payoff hinted at earlier and a funny Charlton Heston cameo)-- it's still filled with laughter throughout. Nicely giving Garth much more to work with-- Carvey manages to steal focus away from the overwhelming beauty of Kim Basinger as her unlikely lover in a film noir retro subplot. Although he still hasn't mastered his confidence problem, we see a much more liberated Garth in this film, as now on his own with Wayne, he's truly relishing in a long overdue sense of freedom while nervously flirting with Kim Basinger at a dry cleaner confesses that he's "sans parents" and "can go to a movie on a school night like that" before he gets the chance to finally go all the way. Bolstered by nice cameos by Chris Farley (expanding on his brief security guard turn in the first movie as their quick-to-anger manic friend), Kevin Pollack as a strict city official whose glass eye leads to a disastrous conversation wherein the guys say "i" much more than they dream, and of course Drew Barrymore as a sultry Swedish radio station receptionist. And while it does feel like its glossier than its heavy metal, rougher original as Canadian Kids in the Hall director Steve Surjik replaced Penelope Spheeris and Myers' decision to move it into a more spiritual and philosophical realm was a bold risk that may have cost him some of the franchise's core audience, I applauded the way that suddenly and very subtly the head-bangers grew and changed into men much more than just "a little older and a little wiser." While they still definitely know how to party, to ask why they needed to party may have been a bit of a jolt but it allowed the film to go into some truly interesting directions-- a few of which while unsuccessful-- I still greatly admire and feel that much like a truly great episode of Saturday Night Live that admittedly does have a few skits that fail, Wayne's World 2 may in fact surpass the first one at least in the sheer number of stand-alone, crazily funny sequences you can easily pull out from that film and watch on their own despite framing them in a shaky narrative structure. As far out plot-wise as any SNL comedy and one that fails to go through the all-too-familiar paradigm the Lorne Michaels productions would establish in the decade-- both to its peril and its delight-- while it was still sad to see Wayne and Garth go and especially to see Carvey never quite achieve that same success despite his amazing ability at stand-up comedy, I'll never tire of watching the two films back to back for some true good ol' "no-money fun."